It was the word “sheriff” that got him. As in, I hope I don’t get arrested by the sheriff doing this. Call it a cheap trick, but when a kid has his head in the iPad and is so mesmerized he doesn’t noticed that he’s not in Michigan in the middle of winter anymore, that the sun is shining and the sky is blue, you’ll do whatever it takes to get him to follow you out the door for a little excursion. Arrested for doing what? he said. I couldn’t just say for picking kumquats; that would lose him outright. Instead I put my most serious face with sunglasses on, started walking swiftly away, and said: Follow Me. And wouldn’t you know it, he did. My nephew danced all around me as I made a still-serious beeline to the kumquat trees along the path to the pool. Why are we getting arrested? he asked over and over again. We have to work quickly, I whispered. The trees were not ours, per se; they belonged to the whole community of condo-owners in our little Floridian enclave. It felt forbidden, pulling the fruit from the branches and stuffing them into our pockets as quickly as possible. I figured a cute child by my side wouldn’t hurt my cause if one of the residents came after me with a broom or something. I had been admiring the kumquat trees all winter, grabbing a little orange globe for a treat whenever I could. I thought often of the first time I had tasted kumquats, which was when I was in culinary school. We made a tart out of them, a beautiful rippled-edged tart filled with pastry cream and topped with candied slices of kumquats. At first I thought I was going to get all OCD on the tart and arrange the tiny slices in perfect concentric circles around the top, but thankfully there was no time as we approached our daily noon presentation of what we’d made. I say thankfully because I was forced to just pour the kumquats over the top of the tart in a rustic way that really did look beautiful, and I wouldn’t have done that had I not run out of time. 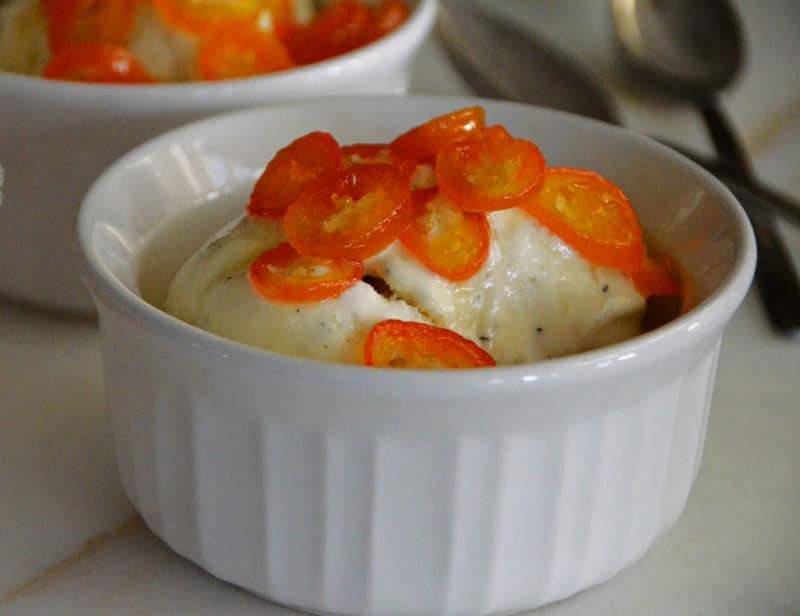 What I loved most about that tart, in addition to getting all rustic in my soul, was the distinct orange creamsicle flavor that resulted from the of pastry cream with the candied kumquats. I wanted that again, but I didn’t want it in a tart. I wanted it quickly and simply and I wanted it cold. Which surprises me because I hardly ever put anything cold in me; I drink tepid or warm water, always, and drinks with ice in them I don’t touch unless it’s a particularly hot day. 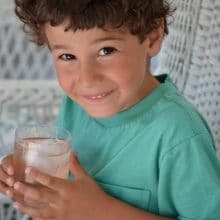 My brother tells me I need to change this habit because it makes me look like an old lady, ordering warm water with lemon. Maybe that’s why I didn’t get arrested making a grab for the kumquats; the neighbors could tell I was a kindred old-lady spirit. The only cold that I make exception, big, big exception for is ice cream. I can’t and don’t eat much of it, but when I do, I want it to be the very best, with toppings to boot. When my nephew John bit into a kumquat on our illicit picking adventure, he promptly spit it out. Dan did something similar when he tasted the ones I bought at Christmas-time, displayed in a beautiful bowl. His big eyes said, how dare you let me eat this? as he tried to chew his kumquat and swallow it. I told him, and John, not to write them off, that what we were going to do with the kumquats, they would love. I’ll only eat it if we don’t get arrested, John said. I can’t guarantee that, I told him, but we’ll do our best. 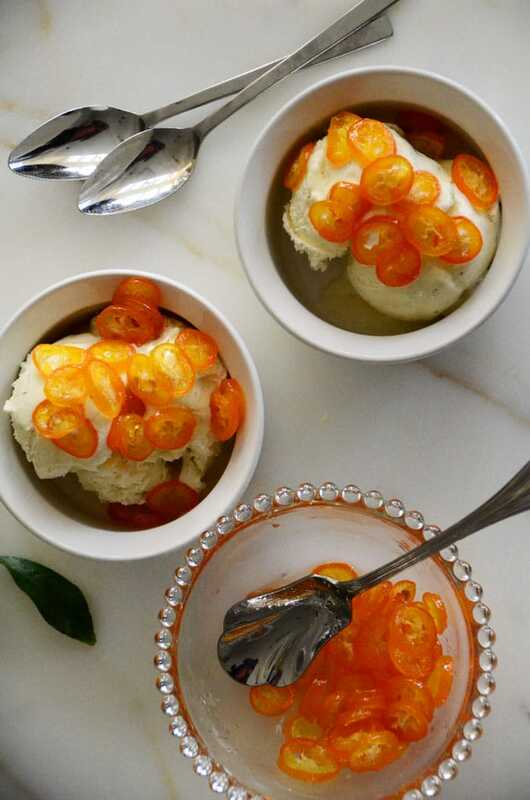 Candied kumquats are perfect over vanilla ice cream. 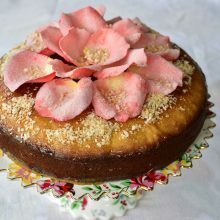 They’re also wonderful atop a pastry cream-filled tart or as a garnish for iced cupcakes. Candied kumquats are delicious in cocktails, as is their flavorful simple syrup. 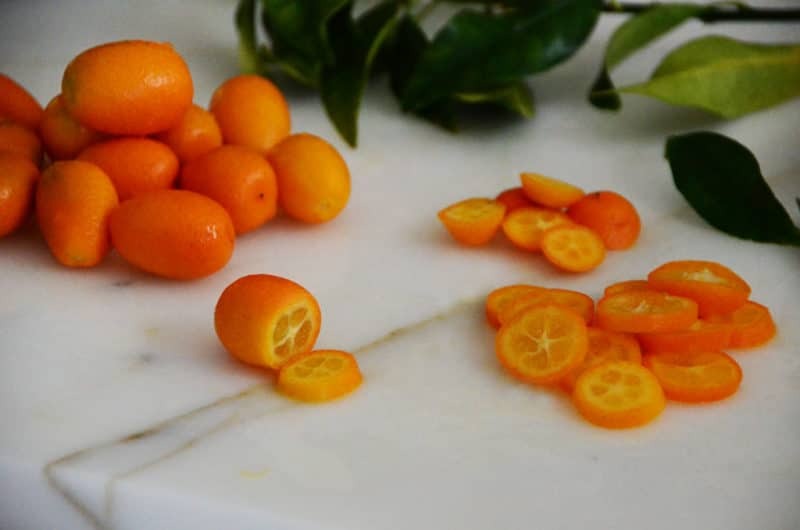 Thinly slice the kumquats very carefully with a sharp knife. 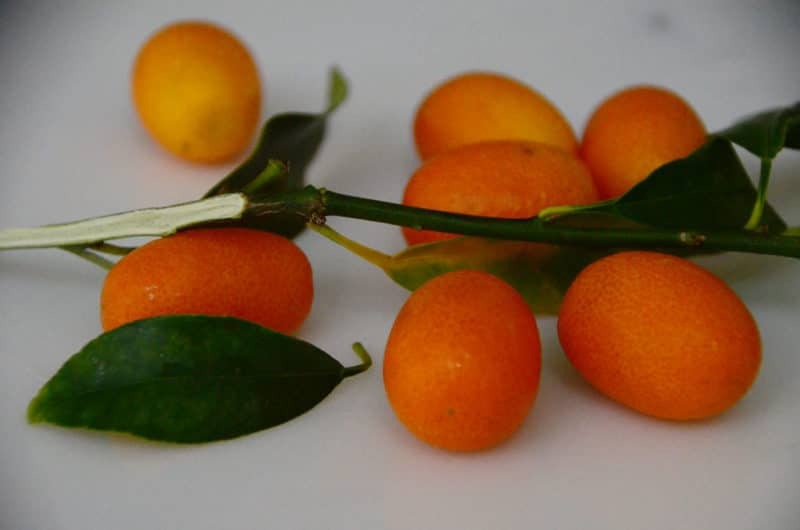 The kumquats are so small that you have to be extra careful with your hands when slicing them. Remove any seeds. 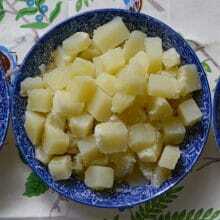 In a small heavy saucepan, combine the sugar with 1 cup of water. Bring to a boil to dissolve the sugar. Add the cinnamon stick, if using. Reduce the heat to medium low and add the kumquat slices. Let the kumquats cook, stirring occasionally, until they are translucent around the edges, about 10 minutes. Transfer the kumquats with their syrup to a bowl or jar. 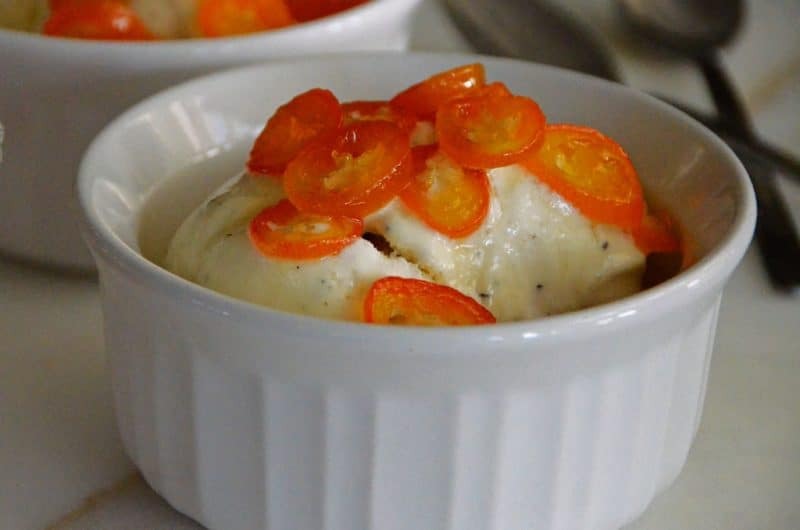 7 Responses to "Candied Kumquats Recipe (over ice cream)"
Love this–the kumquats, of course, but the vignette with your nephew too. Really, lovely. 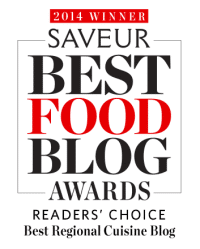 As always, such a lovely story, beautiful pictures, and, a super delicious recipe–neither I nor my husband have ever had a kumquat and this definitely goes onto our expedited list. Blessings. I’ll be interested to know how you both like the kumquats Diane! Love this idea will do with my 6yr old of course will dress up first he will love it. I was hoping you had some suggestions for glazed Cumquats i would like to make them for christmas presents. My Mum had some the other day glazed with cheese she said they were to die for but they werent moist at all any suggestions would be wonderful. I love my cumquats with crepes and icecream i feel totally decadent.